These three flew from North America, though in special crates carried on a cargo ‘plane rather than under their own power. The final leg of their journey of almost 4,000 miles (5,500 kilometres) was by road from London to Devon. The lesser adjutant stork (Leptoptilos javanicus) is a large wading bird. Like other members of the stork family, it has a bare neck and head. It is closely associated with wetland habitats where it is solitary and less likely to scavenge than the related greater adjutant. It is found across India and South East Asia. It can weigh more than 5 kilos (12 lbs) and stand nearly four feet tall (120 centimetres). It doesn’t have a call as such, but is said to clatter its bill, hiss and moan. 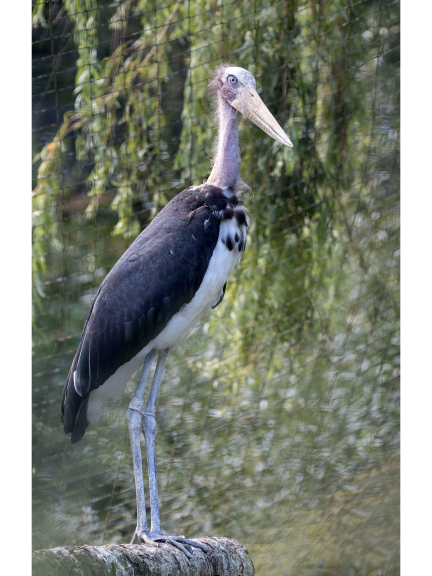 There are three related stork species, the marabou, the lesser adjutant and greater adjutant. Jo: “Marabou storks are the easiest of the three to keep – our keepers now have experience caring for these birds. The lesser adjutant is generally considered more difficult to keep, with the greater adjutant stork the hardest. The greater adjutant is Critically Endangered – it is highly likely that we will lose it in years to come. “If there was an opportunity to work with the greater adjutant in the future we certainly would, and the work we have done with marabou and lessers would give us a very good head start.” Paignton Zoo Environmental Park is a registered charity. For more information go to www.paigntonzoo.org.uk or ring 01803 697500.